A strong dollar has weighed on silver prices over the last several months. Since October, the U.S. Dollar Index has rallied 3.9%. 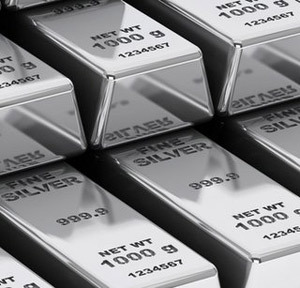 That has pressured the price of silver, causing a 12.4% dip in the precious metal over the same period. China is also key to silver prices because of the metal's vast industrial uses in the world's second-largest economy. China is expected to show its slowest GDP growth in 25 years in 2016. Silver prices fell below $14 an ounce Friday following a robust jobs report. Those strong jobs numbers suggest the U.S. Federal Reserve could continue to hike interest rates in 2016. American Eagle silver coin sales soared on Monday after the U.S. Mint set the first weekly allocation of 2016 at 4 million ounces. That was roughly four times the amount rationed in the last five months of 2015. Demand is surging as silver prices trade at this discounted level. More than half of the week's allocation sold on Monday, the first day of 2016 sales. Nearly 2.76 million ounces of American Eagle silver bullion coins sold Monday, the U.S. Mint reported. That was about half of the 5.53 million ounces that sold in all of January 2015. The U.S. Mint depleted its inventory of American Eagle silver coins in July because of a "significant" increase in demand as the price of silver fell to a six-year low. Inventory was replenished in August and sales resumed. But the coins were on weekly allocations of roughly 1 million ounces for the rest of the year because of low supplies. The U.S. Mint sold the last of 2015's American Eagle silver bullion coins on Dec. 15, ending with an annual sales record of 47,000,000 ounces. American Eagles have been produced annually since 1986. The bullion coins have logged their five best years in 2010, 2011, 2013, 2014, and 2015. Before 2015 took the crown for the highest yearly sales, the old record was recorded in 2014 at 44,006,000 coins. The 2015 annual sales record finished 6.8% higher with 2,994,000 more coins. Silver is popular among smaller retail investors and speculators who aim to gain exposure to gold at a fraction of the price. Silver investors also tend to buy and hold. Traditionally, that means more bang for the buck.